Sometimes I wake up in the morning with the strongest desire to get on my bike and hit the trails. It is hard to say no to this desire, and that is why you will often find me outdoors on my mountain bike. When it comes to mountain bikes, there are few brands that you can rely on. Over the years, I've tried out tons of different brands, with most of them disappointing me. And each time I was disappointed, I always came back to Mongoose. This brand has been built on the desire to get you away from all the challenges in your life, whether they come in the form of work, or home. It is therefore no surprise that I was always attracted to Mongoose. With a bike like the Impasse Dual Full Suspension, I can get up in the morning, climb on my bike, and leave my stress behind. With this bike I can throw myself into my riding, and experience a feeling of relaxation like none before. So if you are interested in knowing more about this bike, continue reading the review below. The Mongoose Impasse has been built with incredible features, a Shimano rear derailleur, SRAM twist shifters, 29-inch alloy wheels, and front and rear disc brakes.These features make the bike ready for hitting the trails, and they ensure that you have a fun and memorable time. The first thing that I notice about a bike is its frame. If a bike has excelled in the construction of its frame, then I am naturally excited to look closer at its other components. In the case of the Mongoose Impasse, we have an aluminum suspension frame. The aluminum construction allows for weight savings, so that you are not weighed down by the bike when you ride on the trails.The aluminum also makes the bike strong and durable, ensuring that you will be enjoying your investment for quite a while. This aluminium also use for electric commuting scooter it is also works perfect. When you also factor in the Element suspension fork, you have a bike that will give you all the comfort that you need. This suspension fork will smooth out all the bumps beneath you so that you can have full comfort and control during your ride. The bike also comes with an adjustable shock, so that you can alter the suspension based on your terrain. When it comes to the Drivetrain of the Mongoose Impasse Dual, you will be greeted by a 21-speed Shimano rear derailleur. This derailleur allows you to take advantage of a wide range of gears, so that you can ride as fast as you want. Furthermore, you have SRAM twist shifters, which make gear changes quick and simple. No more struggling with your gears. The bike also has large alloy wheels, which allow you to ride easily over obstacles. The front wheel also has a quick release function, for easy storage in tight spaces. And when it comes time to stop the bike, you can use the reliable and powerful alloy disc brakes. You will be amazed by how well these brakes work. The Mongoose Impasse Dual has a 3.7-star rating from 157 reviewers. Most of the reviewers give the bike a 4 or 5-star rating, which is respectable for the price. The customers love the wheels of the bike, which make for easy and smooth rolling. Additionally, the seat of the bike is surprisingly comfortable, and customers say that the disc brakes perform very well. The alloy of the bike also keeps the weight down, so that riders do not struggle to control their bike. However, customers say that the shocks do not work well on rough terrain, meaning that you will be uncomfortable on bumpy and rocky areas. 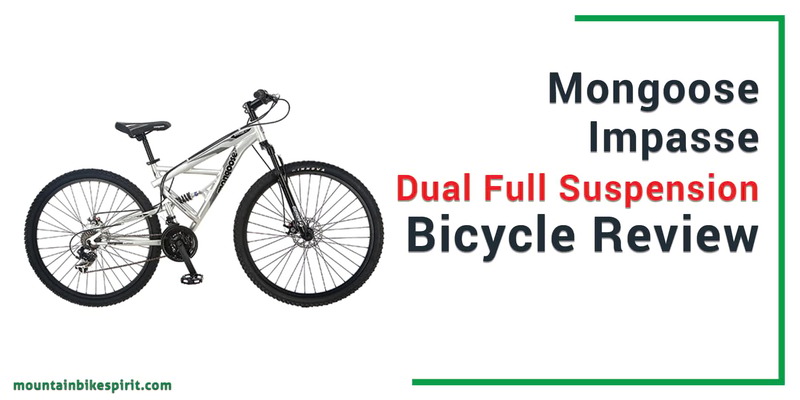 If you are looking for a bike for light to moderate off-road riding, then the Mongoose Impasse Dual is perfect for you. For less than $300, this bike will take you on weekend adventures that are fun and comfortable. Despite the drawbacks, this is still a good bike for you.